At that time, spice merchants were looking for an easier route to Asia. They traveled south past Africa, around the Cape of Good Hope, and continued eastward. Christopher Columbus convinced Queen Isabella of Spain that it would be easier to sail directly west and find the rich treasures of India and Asia. A new route would be found, he said, and possible new lands for Spain. Columbus first asked Queen Isabella for help in 1486, but it was years before she agreed... provided that he conquer some of the islands and mainland for Spain. Columbus would also be given the title of "Admiral of All the Ocean Seas," and receive one-tenth of the riches that came from any of his discoveries. Finally, on August 3, 1492, he and ninety men set sail on the flagship Santa Maria. Two other ships, the Nina and the Pinta, came with him. They sailed west. Two long months went by. His men became tired and sick, and threatened to turn the ships back. Columbus encouraged them, certain that they would find the spice trail to the East. On October 11th, ten o'clock at night, Columbus saw a light. The Pinta kept sailing, and reported that the light was, in fact, land. The next morning at dawn they landed. 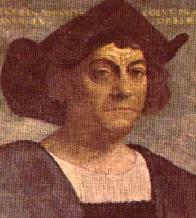 Christopher Columbus and his crew had expected to see people native to India, or be taken to see the great leader Khan. They called the first people they saw "Indians." They had gone ashore in their best clothes, knelt and praised God for arriving safely. From the "Indians" they learned that the island was called Guanahani. Columbus christened it San Salvador and claimed it immediately for Spain. When they landed on the island that is now Cuba, they thought they were in Japan. After three subsequent voyages, Columbus was still unenlightened. He died a rich and famous man, but he never knew that hediscovered lands that few people had imagined were there. Columbus had stopped at what are now the Caribbean Islands, either Watling Island, Grand Turk Island, or Samana Cay. In 1926, Watling Island was renamed San Salvador and acknowledged as the first land in the New World. Recently, however, some people have begun to dispute the claim. Three men from Miami, Florida have started a movement to recognize Conception Island as the one that Columbus and his men first sighted and landed on. The controversy has not yet been resolve. Few celebrations marked the discovery until hundreds of years later. The continent was not even named after Columbus, but an Italian explorer named Amerigo Vespucci. In 1792, a ceremony was held in New York honoring Columbus, and a monument was dedicated to him. Soon after that, the city of Washington was officially named the District of Columbia and became the capital of the United States. In 1892, a statue of Columbus was raised at the beginning of Columbus Avenue in New York City. At the Columbian Exposition held in Chicago that year, replicas of Columbus's three ships were displayed. In 1905, Colorado became the first state to observe a Columbus Day. Over the next few decades other states followed. In 1937, then- President Franklin Roosevelt proclaimed every October 12 as Columbus Day. Since 1971, it has been celebrated on the second Monday in October. Although it is generally accepted that Christopher Columbus was the first European to have discovered the New World of the Americas, there is still some controversy over this claim. Some researchers and proponents of other explorers attribute the first sightings to the early Scandinavian Vikings or the voyages of Irish missionaries which predate the Columbus visit in 1492. The controversy may never be fully resolved to everyone's satisfaction, but 1992 marked the 500th anniversary of the Columbus discovery.